The Guelph Night Market brings its second pop-up market to the eBar Wednesday February 10th from 7pm to 12am ($2 admission). Vintage clothing pickers, artists, screen printers, foodies, writers, record collectors, button makers, zinesters, thrifters, letterpress enthusiasts, antique lovers, upcyclers, knickknack hoarders, book binders, embroiderers, potters, comic book creators, and more will be vending and spending with drinks in crafty hands. 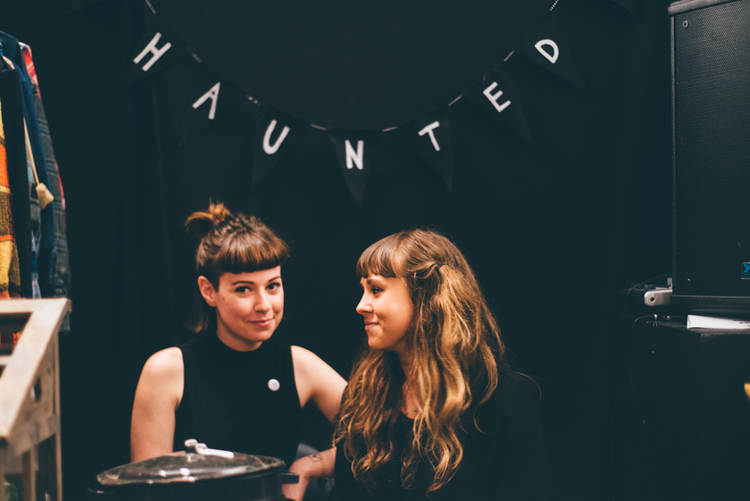 In advance of their Winter Night Market, I talked local shop with Market makers Theresa Mullin & Emily Colley-Divjak. How did the Night Market originate? What brought about its creation? In the past, we’ve always worked well together. Throughout our ten year friendship we’ve always schemed; collecting American coins to get us across the States in the old Tercel or drawing up business proposals for our dream cafe. After moving back to Guelph, the two of us were seeking the perfect project since we were reunited in the same little city. Our number one goal, besides working together, was to enable our hard working pals in their efforts to do what they love... while paying the rent. Have you been surprised with how it has been received so far? Holy moly...yes! When we rented the Making Box space for our first market in October, we were crossing our fingers we’d break even. Looking out the window on the night of, our hearts nearly exploded; there was a line of umbrellas all the way to Quebec Street. Our attendance was over eight hundred and we couldn’t have felt more connected to our city. How do you choose vendors? What are some of the stipulations, frustrations, challenges, joys of choosing? Choosing vendors is an overwhelming and awesome task that we feel privileged with. When people enter the market space we want them to feel excited. It’s easy to become enamored with online folks who create cool stuff and we’re by no means against this method of sharing, but there is something truly special about connecting directly. We aim to bring together a collection of vendors that will ignite the same feeling that we get while reading their application. A huge challenge for us is space… it’s limited downtown. Capacity and accessibility are important to us, but it has been hard to find landlords who will take us and this puts a damper on the amount of tables we’re able to house. What does the Night Market offer that other shopping experiences do not? Shopping at the Night Market is different because it provides you with an opportunity for more than one meaningful connection with vendors. We try our best to provide a warm and inviting environment that lands between farmers' market and thrift shop; somewhere anyone can go and find something with a story. How will the Night Market at the eBar differ from past markets? Our pop-up style is on purpose, being in a different space each market is exciting. Making new connections with local businesses makes us feel more grounded in our community. With the bookstore-bar-restaurant combo, the space is unconventional for an event like ours. Having the ability to “take over” for a night keeps it interesting for us, and hopefully that feeling extends to vendors and folks attending. The eBar/Bookshelf has been amazing to partner with - the space is a Guelph institution. We’re really looking forward to the event. What about handcrafted objects speaks to you? Creating, collecting and curating are extremely personal acts. We think the vulnerability behind sharing those things is extremely important and beautiful. We’re suckers for the connection between things and stories that inspire and challenge us. Our main focus at the moment is to keep our momentum rolling and keep the community engaged in what we’re doing. Our future goals are to run the Night Market seasonally and hopefully in larger, more accessible venues within the downtown core. Do you have any dream vendors? We both have so many art crushes, it would be hard to list all of our existing dream vendors. A cool thing happened this time however, when group of U of G Studio Art students collaborated so that they could table. SADSATURDAZE became an instant dream vendor, with their weirdo assortment of buttons, prints, zines and patches that re-interpret the everyday mundane in a humorous way. We love this. Do you have any advice or market wisdom you like to share with new event organizers? Advice from us two goofs? Lol. Organization, curation and a clear concept of what we want to accomplish have been key to our market planning. Keeping true to our values has kept straight & narrow, and led us to amazing opportunities like our sponsorship from the Stone Store (yay local businesses!). What would you never sell? Ya, we’re still new to this and we’re working out the kinks. Also! Thank you Guelph for all of your support, it means a lot. Also!! We need help finding spaces in the downtown area. Please please email us if you have an available space at guelphnightmarket@gmail.com. Awesome interview! You guys are just so special.